Luke Henry delivers a pitch for Miami Trace during a non-conference game against Franklin Heights Thursday, April 4, 2019 at Miami Trace High School. Henry shutout the Falcons on two hits over five innings. 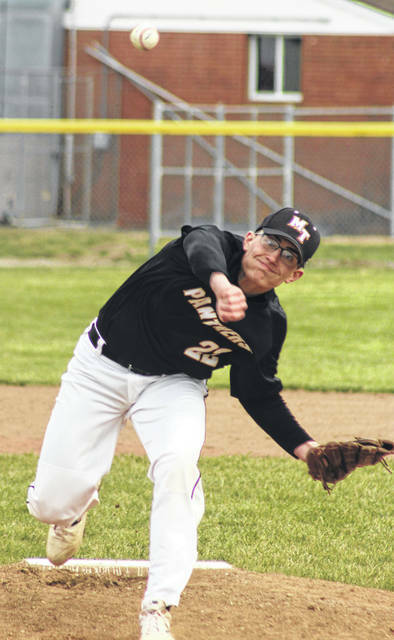 On what turned into a gray, blustery, cold afternoon and evening, the Miami Trace Panthers varsity baseball team hosted the Falcons from Franklin Heights High School for a non-conference game Thursday. Miami Trace won the game, 10-0 in five innings, improving to 4-0 on the season. Luke Henry got the start and pitched all five innings, allowing two hits and striking out six. He issued no walks and got 15 outs on 45 pitches, being very pitch efficient. Connor Bucher had three hits, drove in two and scored twice for the Panthers. Austin Brown had two hits, including a double, drove in one and scored twice. Mason Snow was 2 for 3 and Cody Brightman and Jake Hoppes each had one hit. Tyler Eggleton drove in the winning run with a single in the bottom of the fifth. The Panthers scored one run in the first, one in the second, five in the third and three in the fifth to invoke the 10-run rule. Smith spoke about the Panthers’ offense, which collected 11 hits. “I was pleased, because we didn’t warm up very well,” Smith said. “We were kind of flat in warm-ups. We had five scrimmages rained out, so we only got one scrimmage in. In the bottom of the fifth, with the Panthers leading 7-0, Hoppes led off the inning and was hit by a pitch for the second time in the game. Bucher singled and Brightman reached on a fielder’s choice. Josh Gilmore walked and Drew Batson was hit by a pitch, forcing in Bucher to make it 8-0. Dalton Mayer walked, scoring Brightman for a 9-0 score. Eggleton got his first hit of the season, an rbi single to score the game-winning run. The Panthers are at home Friday, returning to Frontier Athletic Conference play, hosting McClain at 5 p.m. Correction: In Wednesday’s Record-Herald, Miami Trace pitcher Austin Mathews was given credit for striking out four batters in the game against Chillicothe. Mathews actually struck out seven in the complete game, 1-0 victory. Offensively for Miami Trace: Connor Bucher, 3-3, 2 runs, 2 rbi, bb; Cody Brightman, 1-4, 1 run, fc; Josh Gilmore, 0-2, 2 bb, 1 run; Drew Batson, 0-2, hbp, roe, 2 rbi, 1 run; Austin Mathews, 1-3, 1 run; Hunter McBee, 0-1; Dalton Mayer, 0-2, 1 bb, 1 rbi, sac; Austin Brown, 2-3, 2b, sb, 2 runs, 1 rbi; Tyler Eggleton, 1-1, 1 rbi; Mason Snow, 2-3, 1 run, sb; Jake Hoppes, 1-1, 2 hbp, 1 rbi.